Primitive railways serving mines actually have quite a long history, dating back to the 17th century, with iron rails introduced in the 18th. But these “wagonways” mainly served private mines and quarries and were horse-hauled. 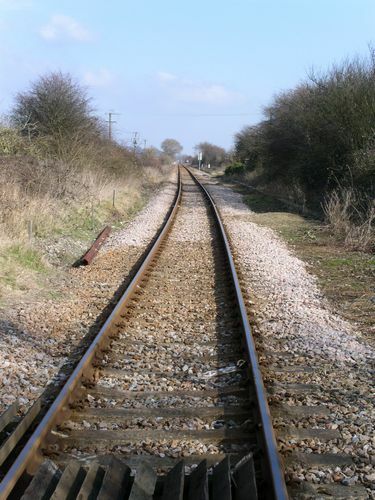 What is reckoned to be the first public wagonway in the world opened to the south of London in 1803 - the Surrey Iron Railway from Wandsworth to Croydon and Mitcham. In 1805 it was extended by the Croydon, Merstham and Godstone Railway to quarries near Merstham. Though a canal opened in 1809 providing easier access, the Surrey Iron Railway lasted until 1846, and some of its original route was later used for the West Croydon to Wimbledon railway line. Part of the Merstham extension provided the route for the London & Brighton Railway in 1838. The Canterbury & Whitstable was initially cable-hauled, however (that is, using a stationary steam engine, a bit like a funicular railway today), and so in the opinion of most historians does not count as the first railway in the modern sense of the word. That honour goes to the Liverpool & Manchester Railway, which opened four months later and caused a global sensation. Unlike all its predecessors it was entirely hauled by mobile steam engines – most famously, Stephenson’s Rocket – and it linked two cities. This gave it a significant passenger focus that no line had had before. The Liverpool & Manchester set entrepreneurs thinking all over the country, and the first result in the south east came in 1836 when the London & Greenwich Railway opened, starting at what is now London Bridge station. To the amazement of its contemporaries, it was built on brick arches – 878 of them (which survive to this day and remain the longest run of brick arches ever built: this is why trains leaving London Bridge are travelling at rooftop level). In 1839 it was joined by the London & Croydon, a separate company which had its own station at London Bridge, and whose other terminus was what we now call West Croydon station. This line went through almost empty countryside, so much so that two stations were named after inns en route and one (Anerley) after an isolated house. The London & Birmingham Railway had meanwhile opened in 1838, starting out from Euston and travelling north through the Chilterns past Berkhamsted and Tring. Just beyond Tring station it created a long cutting that required an immense amount of labour to build in the age before mechanical diggers. Though it is not much noticed today, it was considered a great engineering feat at the time. Also in 1838 the Great Western Railway started operations out of Paddington, though the present station dates from 1854, and 1839-40 saw the opening of the London to Southampton line, which soon became the London & South Western Railway – today’s South West Trains franchise. On the opposite side of London 1839-40 saw the start of the Eastern Counties Railway, whose initial terminus was at Shoreditch, but which became the Great Eastern Railway in 1862 and opened Liverpool Street station in 1874. Kings Cross, the terminus of the Great Northern Railway, did not open till 1852.